There really is no reason to search Google for dead people. If for some reason you decided to though, this is what you would get in the ads on the right. More than likely it will be fixed soon, but it’s funny now. Original idea from here through here. 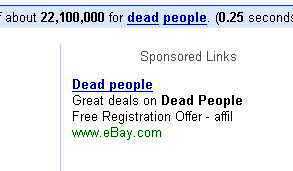 "Deals on Dead People" by Jeremy Felt, unless otherwise expressly stated, is licensed under a CC BY-SA 4.0 International License. Previously: Is the Breyers Included?